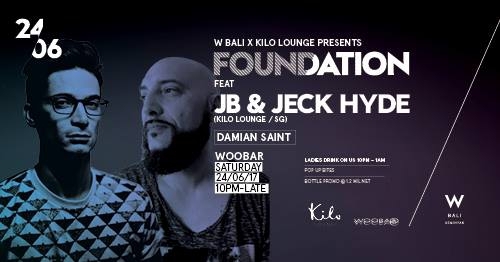 W Bali continues their on-going support of the burgeoning local scene through our latest concept, Foundation. Having most recently given the current crop of Indonesian DJ’s a platform to show how good they really are, W have now extended this concept out to the wider region with a slight twist, as they handpick the finest and most talented resident DJ’s across the whole of Asia from some of the most recognised clubs and venues in the region. Resident DJ’s are the unsung heroes of clubland, they are the ones who are trusted to read and excite the crowd at either end of the night, and ensure the night is a textured experience taking everyone on a musical journey. Often the best of these are critically acclaimed by the headline acts despite not taking the glory, so we felt it is only right we give them the chance to showcase themselves and prove that The Foundation is what everything else is built on! It wouldn’t be an easy task to put a sticker on JB’s musical style and that’s probably a good thing. When he considers DJing, JB thinks of eclecticism and endeavors to open up musical boundaries to embark the crowd on a new journey. His sets are always a musical reflection of what his soul captures from the crowd and the vibe of the place. Eclecticism is the key and JB likes to blend all his influences when he builds his set. That's why he is equally comfortable in building an effective warm-up set as he is in delivering the quality driving tunes during peak time. Renowned on the French DJ circuit since the early 90s, Jeck Hyde has established himself as force to be reckoned with in the underground music scene. Accrediting his roots to Detroit techno, Chicago House and Acid House from the UK, Jeck Hyde’s unique sound is warm and emotional for the listener, while maintaining hypnotic and deep tones that is always groovy.